As its centerpiece, this flag uses an image of the Patchtown.com #385 "Rabid Squirrel" patrol patch. White 100% Polyester flag 12 inches tall X 18 inches wide. High quality permanent print on one side of the flag. Image and text on flag can be printed horizontally (for a flag pole) or vertically (for hanging down a wall). Price includes a line of text arched above the image of the patch, and a line of text arched below the image. The "typical" application is a Patrol Name above and Troop (or Pack, Den, etc.) number below, but you're the boss! Tell us what you want! We strive to customize font and text color to complement the patrol patch you have selected. If you have a preference for font or lettering color, please let us know in the Special Instructions section above. Flag comes with grommets for attaching to a flagpole. Turnaround time for creating these custom flags is one to two weeks. We will strive to meet your desired/drop dead dates, but we cannot guarantee delivery dates. Please call us if you have urgent needs to make sure we can deliver the product as you need. Fanciwork and Patchtown.com reserve the right to refuse to print on a t-shirt or flag anything that may be construed to be offensive. You will be notified via email or phone if we request different text to be printed. 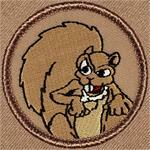 Fanciwork.com and Patchtown.com are independent companies providing scouting collectibles since 1996. We are not affiliated with the Boy Scouts of America, the Girl Scouts of the USA or the World Organization of Scout Movements. © 2019 www.Patchtown.com, All Rights Reserved.